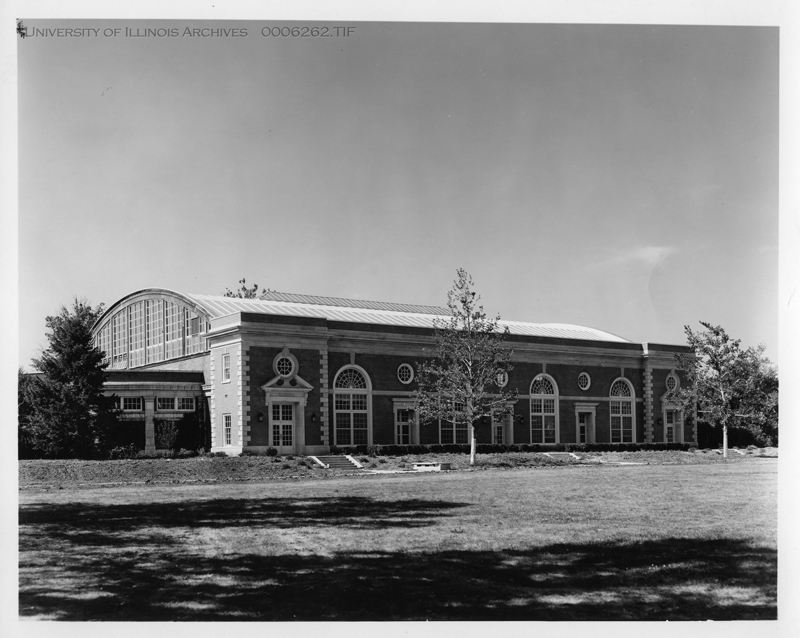 The University of Illinois' Stock Judging Pavilion was built in 1913 in a Renaissance-style design for $112,000. At over 30,000 square feet, this building holds a show arena for livestock that is 216 feet long, 65 feet wide, and mostly made of concrete. The arena can be sectioned off into three parts for individual judging rooms or for other instructional purposes, and can hold up to 2,000 viewers. The circular ends house classrooms and offices (James 1920, pp. 90). 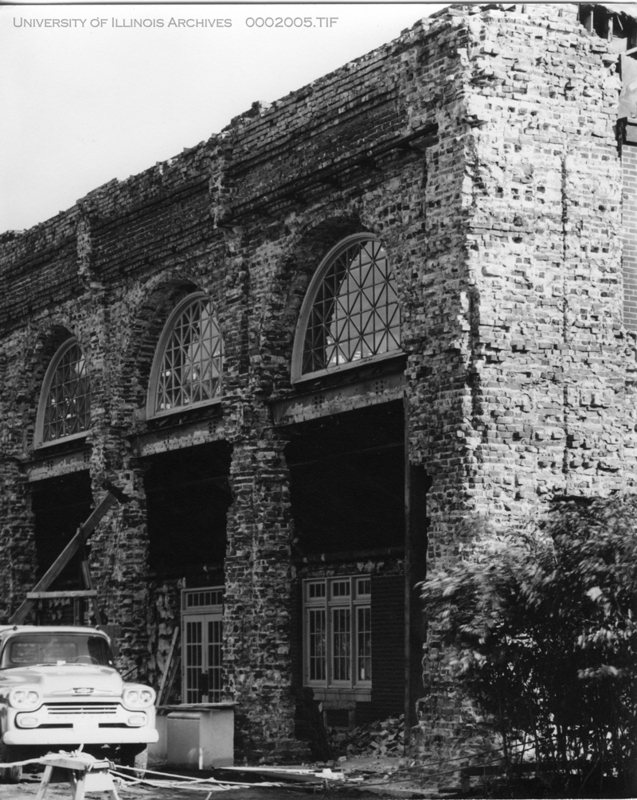 The fireproof building was built of brick, concrete, and terracotta. The reason for fireproofing may have been a result of the destruction of several buildings by fire caused by lightning in the 1890s and early 1900s. 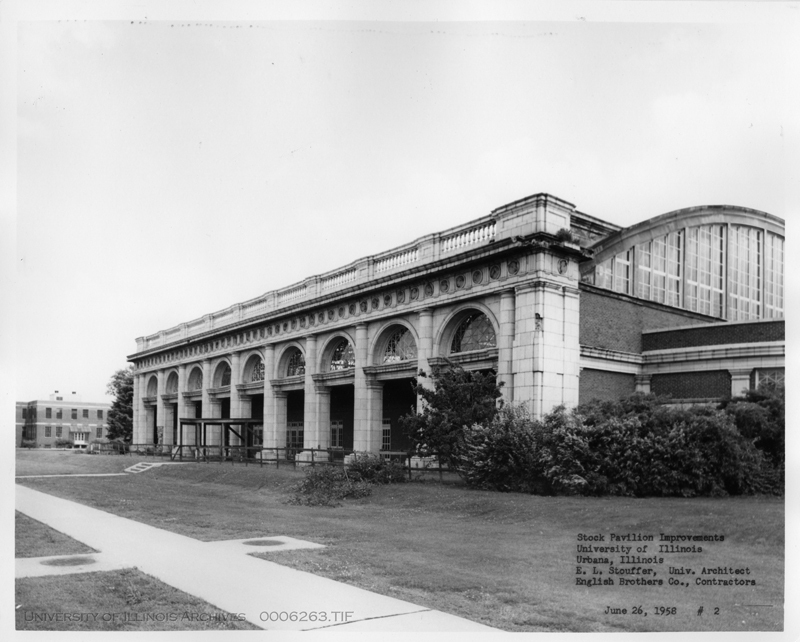 The main purpose for the Stock Pavilion when it was first built was for "...judging and studying stock," which included hands-on animal labs (James 1920, pp. 92). 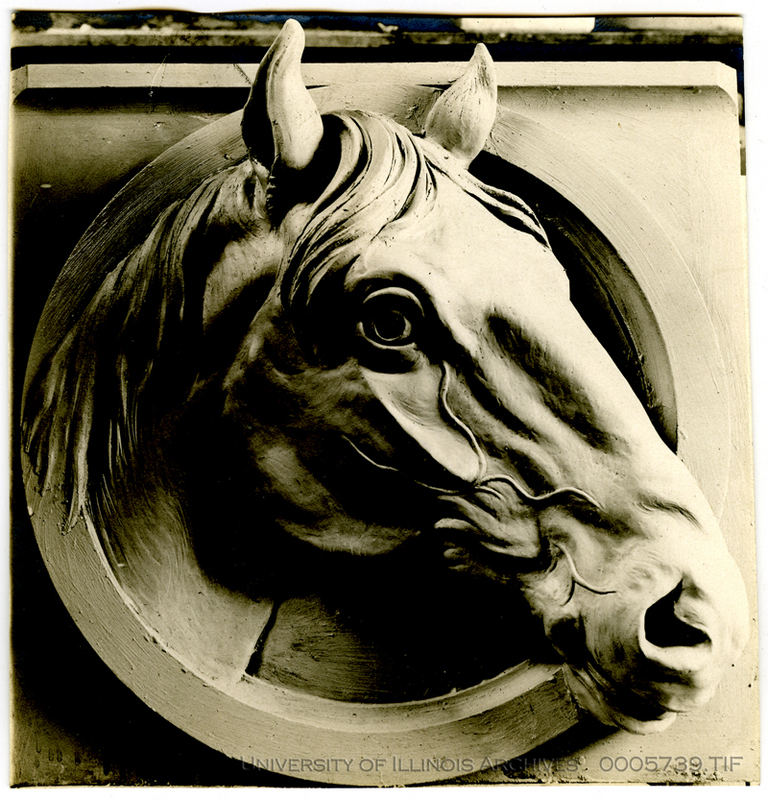 While the Animal Sciences Department still uses the building for similar purposes today, the University historically has used it for wide variety of other purposes. From 1963 to 1974 the Stock Pavilion and the surrounding yards were home to the Spring Carnival, called the Illioskee. For many years (some for many decades) student clubs including the Rodeo Club, the Hoof and Horn Club, the Illini Dairy Club, and the Companion Animal Club have all use the space, the Horticulture Club briefly turned it into a garden for the Mom's Weekend Flower Show, and the annual YMCA Dump and Run has been held there since 2004. The Dump and Run is a rummage sale in the fall where the YMCA sells items that were collected from the public the previous spring. The building was restored in 1958 during the 2-year campus-wide renovation project. The pavilion was allocated funds of $275,000 for the renovation. The Board of Trustees report for May 29th 1958 list the most extensive repairs as the complete remodeling of the north wall, tearing down the old roof and installing an aluminum one, replacing the terra cotta cornices with stone cornices, and improving the lighting in the offices and seminar rooms. 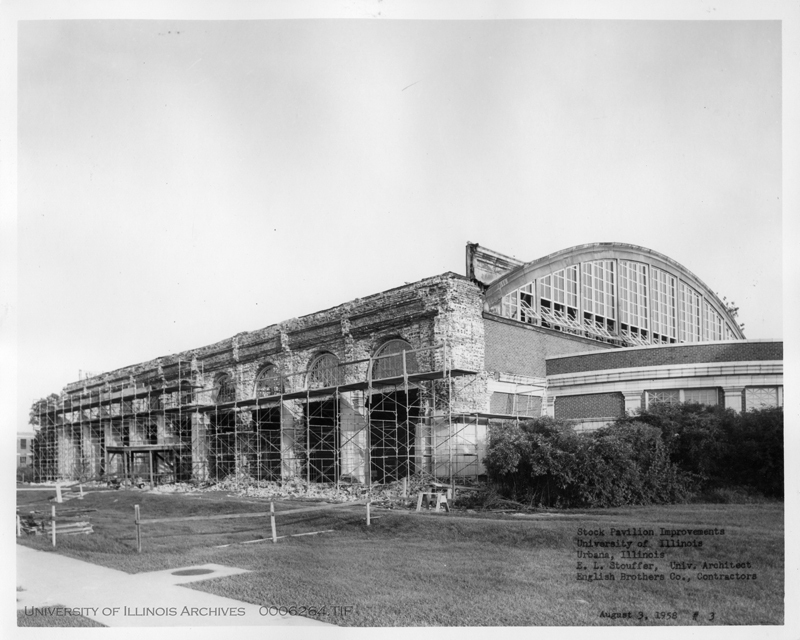 During renovations it was discovered that the building was in worse shape than was originally thought, as most of the interior wood roof supports had been severely damaged by insects and rot. 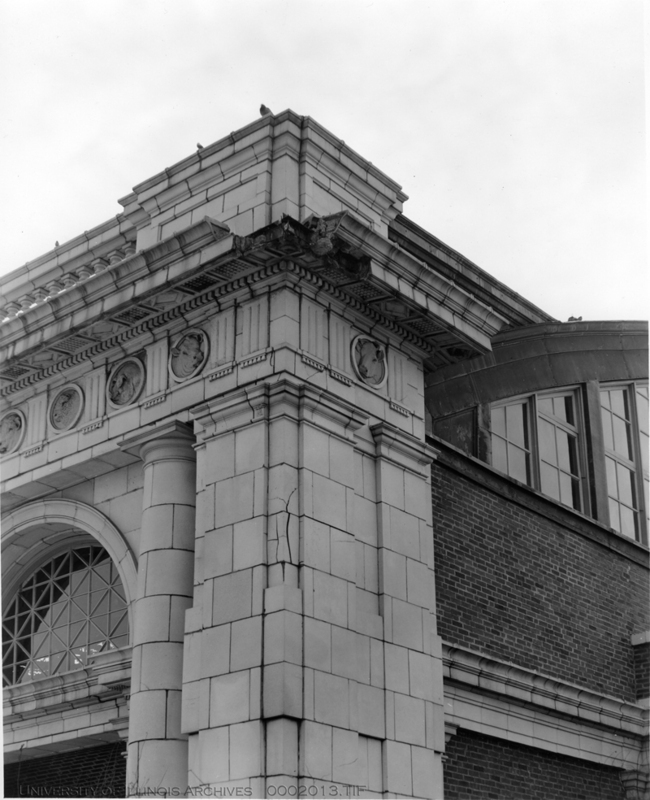 Prior to the 1958, renovations to the exterior north wall of the building displayed 52 terra cotta animal heads, however these were taken down during the restoration in 1958. It is unknown what happened to the animal heads, as only two have been found. In the late 1990s, Dr. Douglas Parrett, professor and current interim head of the Department of Animal Sciences discovered the terra cotta yorkshire pig in the horse barn at the south of campus. 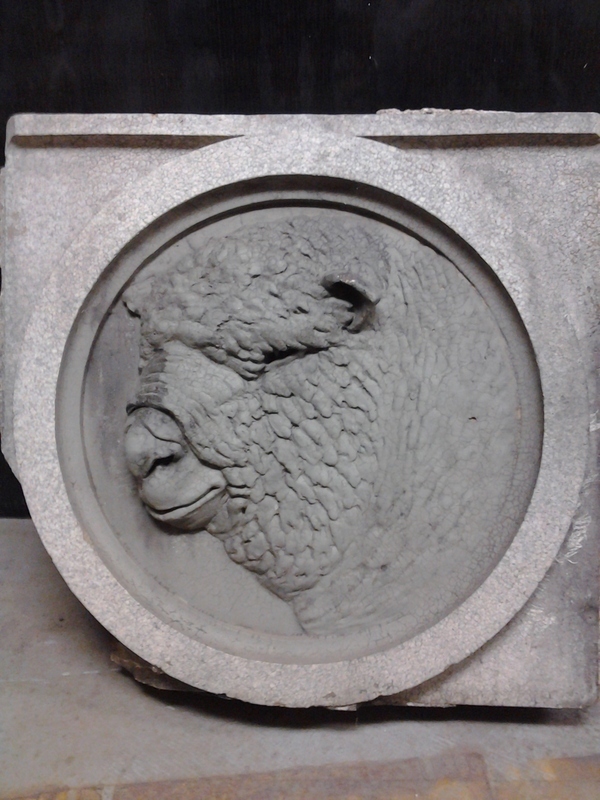 A little while later one of the sheep heads (possibly the Shropshire sheep; there are no close photos of this original animal head) was discovered in a residential garden about 10 miles away from Champaign-Urbana and it was donated back to the University. 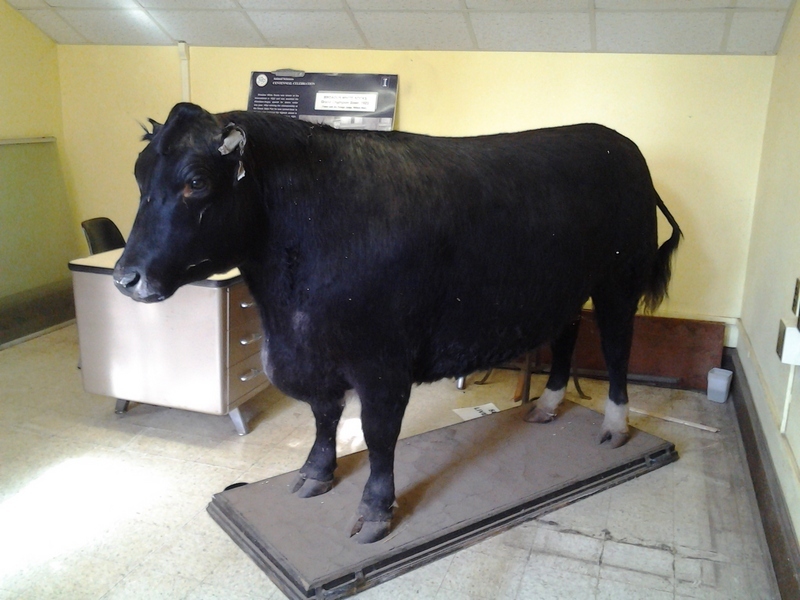 Following up on rumors of a taxidermy steer in one of the offices of the Stock Pavilion, the ExploreCU team spoke with Dr. Parrett (whose specialty is cows) who confirmed its existence. 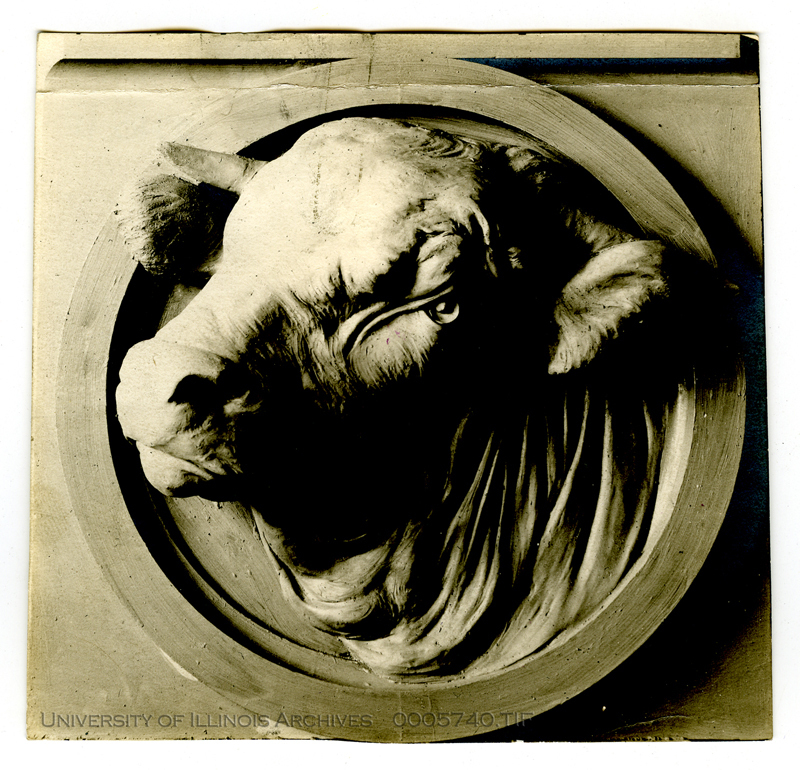 The steer's name is Broadus White Socks and he was the Grand Champion of the 1922 Chicago International Live Stock Exposition. Shortly after winning, he was purchased by Sears-Roebuck & Co. and served as a promotion to attract shoppers to the stores. White Socks even made a trip to Paris, France (Parrett 2012)! After his international tour, White Socks was taxidermied and put up on display at the University's Mumford Hall until the late 1930’s. He was then put in the Natural History Museum with some other taxidermy animals. By the mid-1940’s his ears were showing some wear and he was placed in storage in the English Building with other broken items. In the mid-1980’s, during a renovation of the English Building, Dr. Parrett received a call about White Socks. He and some of his colleagues put Broadus on a rolling cart and rolled him across campus to the Stock Pavilion where he has resided ever since. Broadus White Socks occasionally makes an appearance at campus livestock event. The department has considered the possibility of finding someone to repair his broken ears and tail in the coming years. 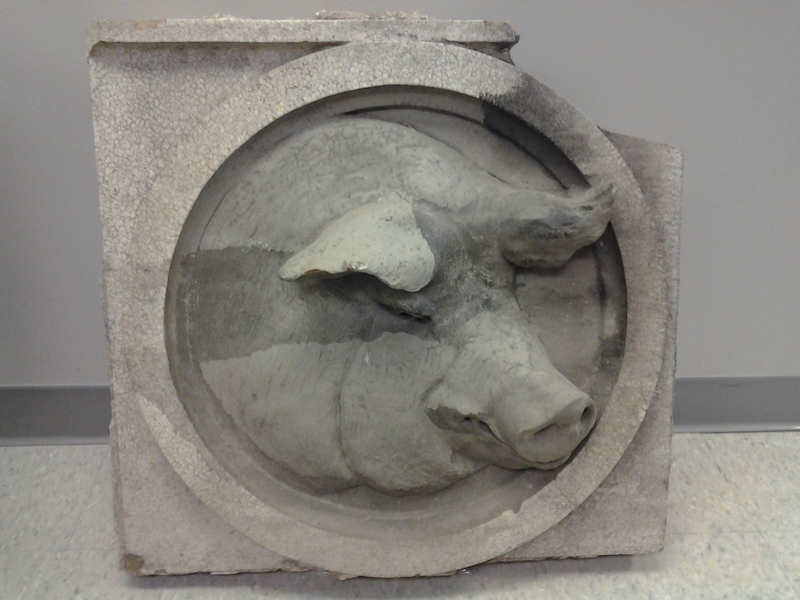 Yorkshire Pig: Terra cotta pig head in the Animal Science Building, originally on the north face of the Stock Pavilion. Discovered in the Horse Barn on south campus. Sheep Head: Terra cotta sheep head located in the Animal Sciences Building. Originally on the north face of the Stock Pavilion. It was discovered in a private garden 10 miles away from campus. 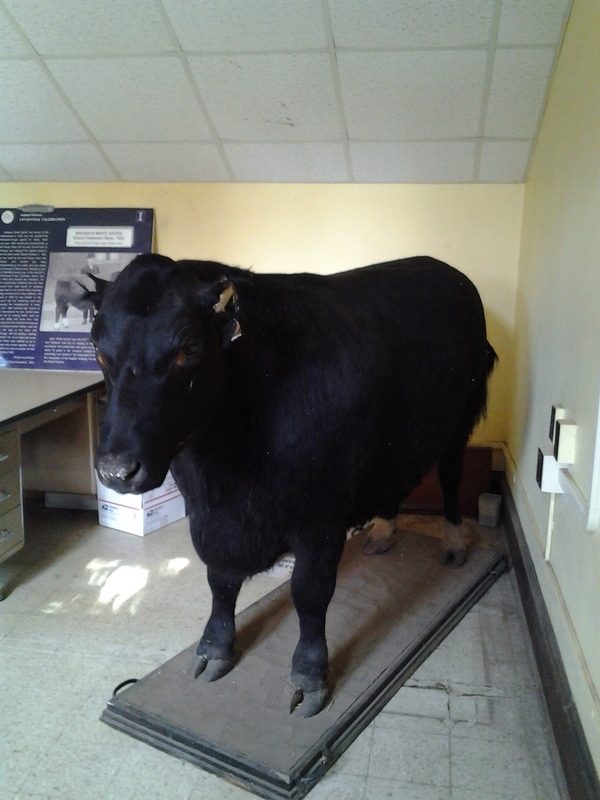 Broadus White Socks: This taxidermy cow is in really good condition for being almost 90 years old! Broadus White Socks was the 1922 winner of the Chicago International Livestock Exposition. 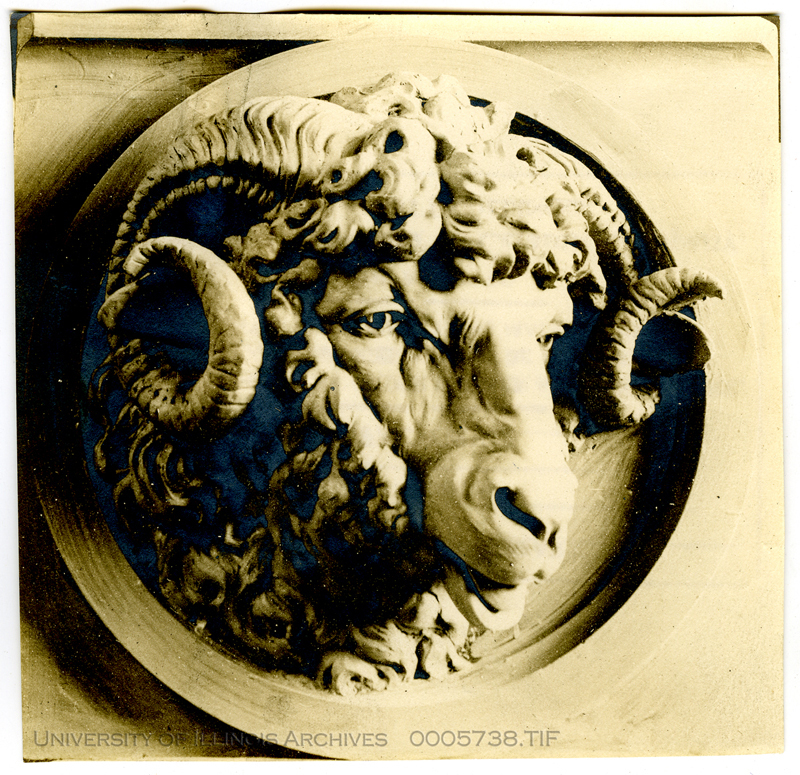 He was stuffed and donated to the University in the late 1920s. 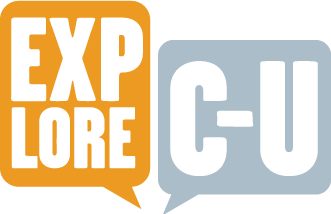 Image Courtesy ExploreCU Team. Kara Brehm, “Stock Judging Pavilion ,” ExploreCU, accessed April 21, 2019, https://explorecu.org/items/show/190.